Here at ChemDry CleanDry we love our pets. They brighten up our day and they’re always there to support us, through thick and thin. However, they can make it a real challenge to keep your home clean, healthy and smelling fresh. 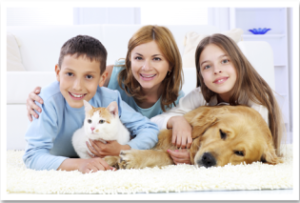 Chemdry CleanDry can eliminate pet urine odours from your carpets and rugs by applying our revolutionary cleaning product P.U.R.T.® (Pet Urine Removal Treatment). P.U.R.T. contacts the source of the odour and then immediately begins a chemical reaction that destroys the urine odour. It’s shown excellent results on even the most severe urine damage.